There's something magical about beer fermented and aged in wood. Rocks, are cool, too. I've had German stein bier before in which hot stones are used to push the unfermented beer to boiling, causing the sugars to caramelize on the rocks. These rocks are then cooled and added to teh fermenting beer. The stein bier or "stone beer" that I remember drinking was the Rauchenfelser Steinbrau. I recently found another stone beer. 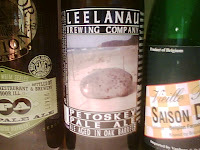 The beer is Petoskey Pale Ale from Leelanau Brewing Co. The stones in this beer weren't heated up, but added to the beer during fermentation and aging in a large oak barrel. Another unique aspect of this beer is that it was fermented with Petoskey stones. These interesting rocks, composed of fossilized coral used to be found on beaches in the northeast lower peninsula of Michigan. I used to comb Lake Michigan beaches as a kid trying to find Petoskey stone. They would be hard to find if they dry, because they just look like a smooth gray stone. However, if the stone was wet or polished it would show the markings of the fossilized coral. I never dreamed I would find a beer made with Petoskey stones. I expected an earthy tasting beer or at least of a hint of minerals. 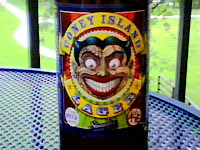 I don't know that the Petoskey stones added that much flavor, but the beer did taste rather complex. It had a beautiful rocky head, too. The Petoskey Pale Ale in my glass was a cloudy amber ale and smelled of tropical fruit with a bit of fresh yeastiness mixed with earthy and spicy hops. 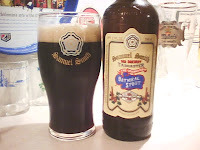 Some faint traces of spices such as cinnamon and allspice emerged as the beer warmed up. The finish was pleasant; slightly tart and just a touch bitter. I found the Petoskey Pale Ale at Siciliano's in Grand Rapids, Michigan. 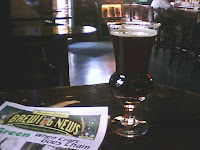 It was a great place for beer and must visit for beer lovers as myself and other members of Beer Advocate suggest. All the beers were priced individually and the Petoskey wasn't cheap: about $10 for 16-ounce bottle, but I just couldn't pass up a Petoskey stone beer. 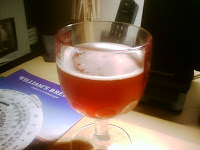 The red ale I wrote about in my last post has been bottled. It was another three-gallon batch. I filled 14 22-ounce bottles, 1 Grolsch swingtop and a large 1-liter swingtop. The red ale tasted great. It has a decent hop aroma, sweet caramel flavors with just a hint of roasted grains a lightly hoppy middle and long hoppy, smooth bitter finish. Citric hoppy flavors and bitterness builds with each sip. The body is fairly light; the batch attenuated well. Assuming the bottle conditioning goes well, I may need to brew another batch of the stuff. Meanwhile, the blond American bitter in my Party Pig has smoothed out a bit. I suppose some lagering has occurred, even in the last week or so. 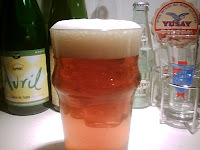 It tastes much better, but it is still lacking the toasted malt flavor of the previous batch. I've got another batch of beer going. This time it's a three-gallon batch of red ale that should almost fit into the IPA category. (It's an estimated 53 IBUs.) I copied a recipe from last year: three and a half pounds of light dry malt extract, a quarter pound each of 135-150L and 70-80L British crystal malt along with a half ounce of 7 percent alpha acid Amarillo pellet hops, another half-ounce of these same hops at 30 minutes and a full ounce at 15 minutes left in the boil. 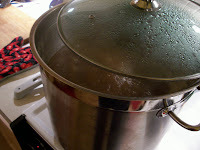 I cooled this with my immersion wort chiller and pitched one packet of Safale S-04 yeast. I brewed this up last Sunday and I'm planning on packaging the whole batch in 22-ounce bottles later this week, although I'm contemplating dry hopping. 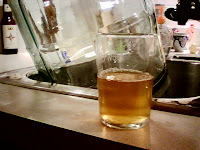 Meanwhile, my recent batch of Americanized bitter is pouring from the pig, but it isn't as toasty tasting as the last batch. I'm not sure what happened. The beer is plenty bitter, but just doesn't have the toasted malt character that I like. 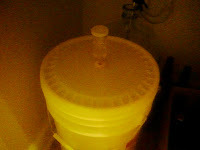 Perhaps my grist was poor or maybe I just over hopped it. It's hoppy and bitter, but otherwise a bit two-dimensional: just fruity Simcoe hops and sweet malt. I'm not sure I like the Simcoe hops and will probably go back to Amarillo the next time I brew. Bachelor ESB is a beer that I can remember reading about in one of legendary beer writer Michael Jackson's book Ultimate Beer. It has been a long sought after beer for me. 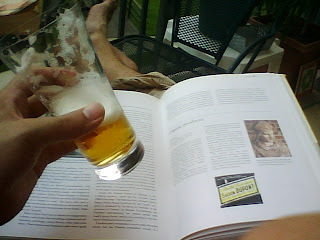 In this book, Jackson describes the beer as, "big-tasting" and "notably firm and assertive, with a fresh dryness of American hop flavors and clean, orangy fruitiness." After a few sips, and as the beer warms up, I notice that what I really like about this beer is that it starts out fruity (orangy as MJ would describe it), but ends with solid bitterness that creates balance and a slight lingering bitterness. This is a great ale that is worth seeking out. A big thanks goes to Fred for picking this six-pack up while touring the Pacific Northwest and Ryan for sharing. 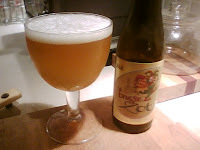 Enjoyed a Brugse Zot this evening; inspired by none other than...Rick Steeves? Details can be found at the Marcobrau Beer Pages. The beer is the current Belgian Beer of the Moment. 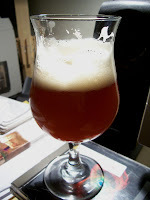 Also enjoying a recent batch of homebrew that was meant to be a Biere de Garde, but has ended up more of a cross between a Witbier and a Belgian Pale Ale. I've been enjoying this beer from one of my Party Pigs. It's tasting a little oxidized, but is otherwise toasty and more assertively bitter than an authentic wit or Belgian would ever be. S'okay, as it's a decent everyday sort of "house" beer. Meanwhile, I'm thinking of brewing a dunkelweizen for an autumnal ale. Nothing beats beer on my balcony biergarten. Bell's beer is back in Illinois. Sure, we've getting beer from Bell's under the Kalamazoo label, but it hasn't been the same. The "faux"-beron that I've been seeing lately is a decent summer wheat, but not quite the same as Oberon, but then again Oberon isn't even my favorite summertime Bell's beer. Well, today I found my favorite and it's Bell's Third Coast Beer. 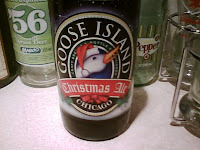 This is not to be confused with the Third Coast Old Ale. T.C.B. is a much different product. It's a straw colored lager-like beer with American hops and an interesting grassy, yeasty nose (no doubt the result of the beer being unfiltered.) This light (roughly 12 Plato) beer has a rather tasty toasty malt flavor, pleasant bready yeastiness and crisp, moderately bitter, lingering finish. For me, it's the perfect accompaniment to a late summer afternoon. Reviews on Beer Advocate are a bit mixed; I suppose in support of this beer I would advise the consumer check the bottling date to make sure it's fresh. 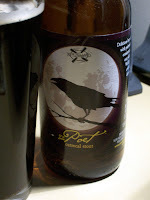 There is a code on the back of the bottle that can be entered on the brewery's website that tells you the bottling date. Of cousre, either you like this beer or you don't. Avril not your average saison, or is it? I've read that many, many years ago Belgian brewers produced a much lower strength Saison than what we typically see today and I've always wondered what a truly "sessionable" farmhouse ale would taste like. I've made some attempts to homebrew Saison-style beers in the 4 to 4.5 percent range, but until now I've never seen a commercial example. I've always enjoyed Saison DuPont, so when I found Avril from Brasserie DuPont, with "Biere de Table" on the label I knew it had to be a more sessionable version of the classic. Upon a closer inspection I noticed the alcohol content of 3.5 percent written on the label. This discovery made me even more curious. Could such a small beer be packed with all that great DuPont flavor? The short answer is yes. Yes, with a disclaimer I suppose. Avril is much lighter then the classic Vielle Provision Saison DuPont and there is much less alcohol, which admittedly is a component of the beer's flavor. However, most of the other parts of what makes a great Saison are present. The enormous rocky mousse-like head, the light color, the delicate grainy and earthy flavors and of course, the lingering dry finish. Delicate peppery hops seemed in perfect balance with the small of grain used to make this beer adding just enough complexity and pleasant bitterness. Overall, I would love to be able to brew something like this, but I imagine it would require complete control of the process. 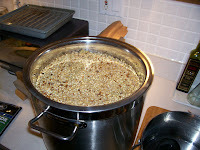 I other words, an all-grain recipe with mash temps kept fairly low to ensure a complete fermentation. 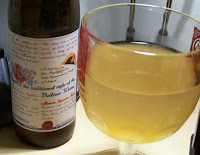 I don't know that I'll tackle such a project yet this summer (especially since I recently brewed a light Belgian Pale Ale), but such a lovely light beer would be great for next year. Decided to stop by the Lunar Brewing Co. in Villa Park after work today, just to see what was new. I ended finding a mighty Wee Heavy, served in a giant thistle-shaped glass for $6. This chestnut-hued ale was rather straightforward, but tasty with caramel malts balanced by a judicious amount of hops and unusual spicy character. (The beer is pictured to the right.) There were many other treats at Lunar Brewing Co., including a 10 percent alcohol anniversary beer from Surly Brewing Co. in Brooklyn Center, Minnesota. Very intriguing. What monster could Surly have created? I was tempted, but after 21 ounces of the Wee Heavy (and remembering that I had another Scotch Ale at home) I decided I should probably just head home. However, I will back soon to the Lunar, to sample the house beer along with the fantastic line up of guest beers that included craft brews such as Two Brothers Hop Juice, Founders Dry-Hopped Pale Ale, Victory Golden Monkey and Three Floyds Robert the Bruce. 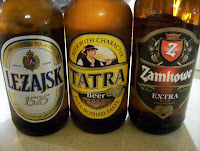 Many other craft brews and imported lagers and ales were to be found in the cooler; some more reasonably priced than others. The other house beers included the popular Moondance IPA, Marzen, raspberry cream ale, oatmeal stout, a Maibock and a nut brown ale. Lunar Brewing has a page on Myspace, which is updated fairly often. 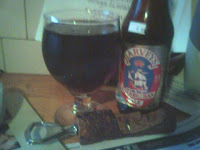 Once I home, I poured a bottle conditioned Arcadia Scotch Ale and decided to make the evening a mini-Scotch Ale tasting. I've had some Arcadia beers before and the brewery is a very interesting traditional English operation. The Arcadia Scotch immediately differed from the Lunar Wee Heavy. The color was a darker chestnut and it had a more powerful aroma of raisins. 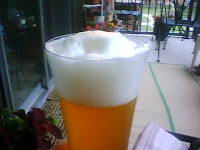 The carbonation, was good. I've found Arcadia beers to be fairly highly carbonated, so I gave the beer a more vigorous pour to help ensure a smooth mouthfeel. The bone white head didn't last too long and dropped leaving a tight collar of foam. 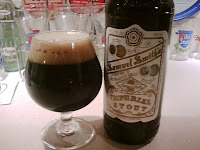 The first sip was smooth and cleanly malty with some toffee character emerging towards the finish, which ends up being a mouth full of raisin character and alcohol laced with a roasted grain and hop bitterness. 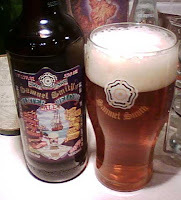 The heavy caramel malt flavors lingered on my tongue creating a long finish that was just short of cloying. Arcadia Scotch Ale is definitely one of the good ones. The brewery is inconsistent: I've had good beers, outstanding beers and poor ones from them, but I have to congratulate them on the Scotch Ale. I opened this beer thinking it was a Dogfish Head Indian Brown Ale kind of evening. Starting at 9pm I'm going to be waiting for my work pager to go off, so I thought I'd have one beer to sort of calm the nerves. I've had the Indian Brown Ale before and had mixed feelings about it, so I thought I'd try it again. Something about a dark brown ale fits a cool, wind-whipped rainy day. This particluar dark brown ale smells quite good; the aroma of dark dried fruits such as figs and raisins is assertive and has me anticipating a sweet tasting beer. There's a hint of coffee with cream in there, too. The mouthfeel is slippery smooth with just a bit of the tingle of carbon dioxide. 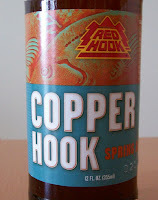 The hops are certainly kept in check until towards the finish and they're more earthy than spicy. 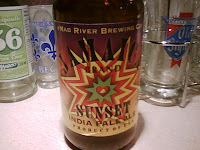 A fairly bright tartness comes through initially in the rather balanced finish. After some time, this character turns a touch medicinal, but is not offensive. The bitterness is not as pronounced as the 50 IBUs (according the brewery's website) would suggest; perhaps all the sweet malts and caramelized sugar has tamed the bite of the hops. The finish is actually rather rich with latte and burnt caramel notes. 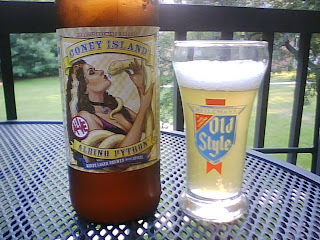 Despite its surprisingly low viscosity, this is certainly not a low-calorie beer, this is verified in the sweetness. Lest I forget, it's a good looking beer, too. A collar of foam persists well after the head falls and some sparse bits of Brussels lace are left behind. The Dogfish Head Indian Brown is certainly an enjoyable beer with the kind of burnt caramel sweetness that is satisfying this time of year, much like a springtime bock. I'm drinking this solo, but the brewery's website mentions pairing with balsamic vinaigrette salads, smoked meats, duck confit, braised ribs, venison, prosciutto and stews. 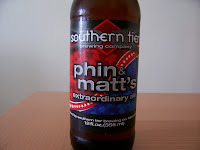 It also mentions that a 12-ounce serving is 238 calories, which makes the beer a bit of a snack in itself.